Ever since we were kids, there were very few things that could make us as spontaneously happy as a packet of chips. Whether it was a school picnic or a birthday party, no meal was complete without snacking on our favourite packet of Lay’s. As we’ve grown older, we’ve only evolved into our chip personalities – with everyone having a favourite flavour that they can’t live without. So whether it’s eating Masala Lay’s at our desk at the end of a long day or chomping on Thai Sweet Chilli flavour while watching the latest season of a show on Netflix, chips make everything better. This year, Lay’s conceptualised a unique sensory and culinary experience at Milan Design Week, called Lay’s Chiperie. 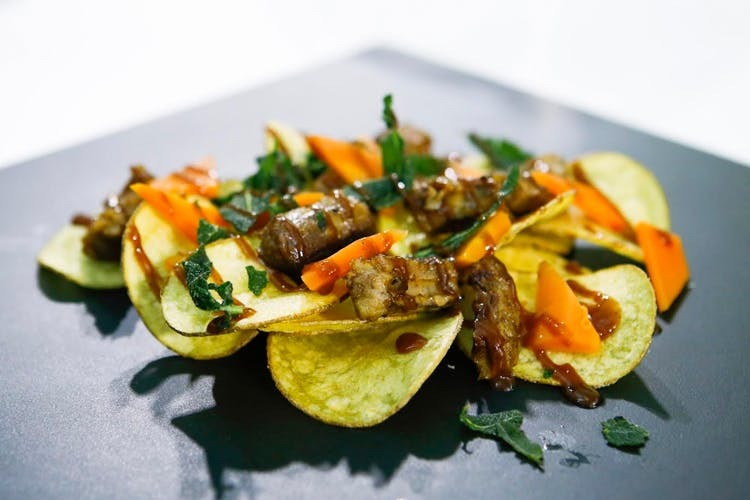 With innovative recipes by Chef Andrea Mirandi that can be recreated in the comfort of your own home, read on to up your chips game. There are very few things in life that barbecue sauce can’t make better. For the rest of it, there’s always Lay’s. Try this unique blend for added flavour to your regular chip snacking session. 2. Sauté a clove of garlic with a nut size of butter, add the ribs and a bundle of sage. Blend with a glass of white wine and cover with lightly salted meat soup. When the meat starts to separate from the bones, drain and debone it. 3. Aside peel the carrots, cut them in slices and cook them in water spiced with vinegar, a pinch of salt and sugar. 4. Mount the chips, putting a drop of barbecue sauce as a base, a cube of ribs browned in a pan veiled with oil, a carrot slice and a fried sage leaf. Honestly, who doesn’t love a shrimp cocktail appetiser? Now make it one step better by blending it with your favourite pack of Lay’s! 1. Mix the shrimps, cherry tomatoes, red onion, celery, vinegar and chives. 2. Cut the onion a la julienne and marinate it with oil, salt and red wine vinegar; after about half an hour, add the tomatoes chopped in 4 and cubed white celery. 3. Remove the carapace from the shrimp, sear them in a frying pan with a bit of oil and place them on the chips. Decorate and season with Catalan and a pinch of chopped chives. Take a twist on the traditional fish ‘n’ chips and make it fish with chips instead! Get yourself a can of tuna and your favourite pack, and wow your tastebuds with these interesting mix. 1. Mix black sesame soy sauce, acacia honey and tarragon, mayonnaise. 2. Marinate the tuna fillet in extra virgin olive oil, soy sauce and black tea. Dry it, pass it on sesame seeds and roast it in a pan. 3. Cut into cubes, place over the chips, a drop of honey and frost with a soft mayonnaise flavored with lime and tarragon. We know the true chip lovers will love these cool new takes on a bag of plain Lay’s. So go ahead and experiment, and tell us how it was! Follow Lay’s on Facebook, Twitter and Instagram for exciting updates and information.